1) This week’s profile is a three song medley. Each with a specific focus. Cadence, how fast you turn the pedals. A build, a song where we incrementally add cadence or resistance (i.e. build) before recovery. And lastly, intervals. 2) The idea with the medley is to attack each track differently. Cycling isn’t all about pedaling downhill. After a 12 minute warm-up, there will be two rounds of work. Here’s the playlist. [Ed note — I put the first working song at the beginning of the playlist. So you’ll see it repeated twice]. Here’s the EverNote file I use to gather my thoughts for the ride..
3) The first track is from multi-instrumentalist Eric Dolphy. He died tragically in Berlin from a misdiagnosed diabetic condition. He is one of the great improvisors on the alto bass and bass clarinet. 4) We’ve listened to a a lot of free jazz this season. If you’re a fan of the TV show “Homeland,” you know free jazz. Matter of fact, the most recent season starts with a song we use a lot . . . “Final Thought” by Kamasi Washington. The idea with free jazz is to let the moment move you. Very little is written . .. structured yes, but not written. Kinda like what we do in class. I provide structure, you guys fill in the effort part. 5) Oh yeah, German expressionism will be our movement of choice for the next little bit. 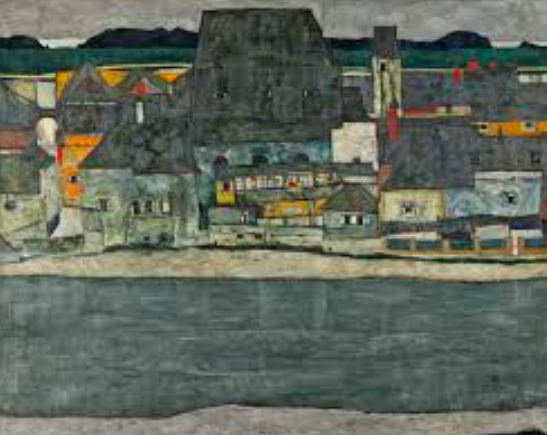 Egon Schiele’s centennial is in its last month. He is considered one of the master’s of expressionism (see below for proof). Our mural, “Weisses Haus in Dangast” is by Erich Heckel (see his page from the National Gallery of Art). Expressionism focuses more on what comes from within the artist and less concerned with the visual depiction of the outside world. So let your legs express themselves. The numbers will come if you let the legs lead the way. 6) So December though March is the indoor cycling off-season. I’ll talk less about cycling and more about training and how we are building for April-November.